Price Law Group is a bankruptcy law firm that assists clients nationwide with their most imminent bankruptcy and debt relief matters. While their main office is located in Orange County, California, the law firm serves clients nationwide and has office locations in Nevada, Arizona, New York, New Jersey, Colorado, and Kansas, in addition to California. If you are caught up in a tough financial situation and you are unsure of how to handle your overwhelming amount of debt, talk to a bankruptcy attorney from the firm today. They have a talented, experienced legal staff that can help you resolve your debt through Chapter 7 bankruptcy, Chapter 13 bankruptcy, debt settlement, or another alternative option. The firm also provides legal services for foreclosure prevention and defense against abusive creditors. You, as a debtor, have rights under the Fair Debt Collection Practices Act. You have rights against creditor harassment and abusive debt collectors that may call at absurd hours or speak to your friends about your debt. The team at Price Law Group works diligently to ensure that each client has their debt related matter taken care of in a swift and pain-free fashion. As an experienced bankruptcy law firm, they understand that having to face the fact that you owe thousands of dollars to a bank or another company is frightening, and can cause serious psychological harm to a person who does not handle pressure well. Let the bankruptcy attorneys from the firm guide you through the debt relief process no matter where you live. They have helped thousands of debtors in the past, and they will continue to help you and your family to achieve a debt free future. 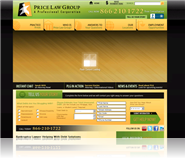 Contact Price Law Group today to schedule your initial, free consultation with an attorney at the firm! 7 Can Wage Garnishments Be Stopped? ¿Puede un cónyuge llevar a la quiebra a sus obligaciones alimentarias en Florida?